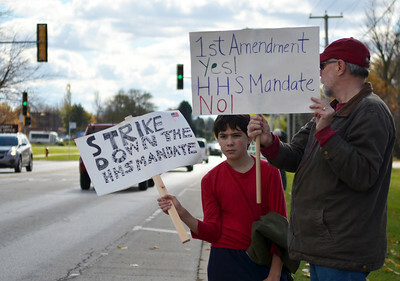 Monica Maschak - mmaschak@shawmedia.com Paul Kranenburg, 11, and his father, Dave Kranenburg, 58, of Woodstock hold signs for passing cars during a rally against the HHS mandate in front of the McHenry County Court House on Saturday. 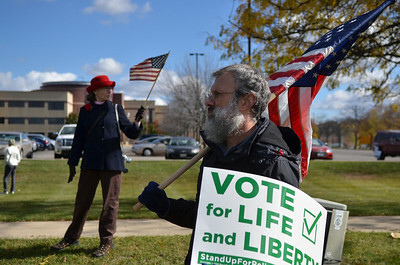 Monica Maschak - mmaschak@shawmedia.com John Bauer, 53, of Woodstock holds a sign and an American flag in participation with a rally against the Health and Human Services mandate held in front of the McHenry County Court House on Saturday. The mandate requires all employer health plans to provide free contraceptives, sterilizations and abortion-inducing drugs, regardless of any moral or religious objections. "One of the things left we can do is vote," John said. John Bauer, 53, of Woodstock holds a sign and an American flag in participation with a rally against the Health and Human Services mandate held in front of the McHenry County Court House on Saturday. The mandate requires all employer health plans to provide free contraceptives, sterilizations and abortion-inducing drugs, regardless of any moral or religious objections. "One of the things left we can do is vote," John said.